I have been missing in action from here for some days now and that is because I was busy with my elder one's school activities and project assignments. Me being interested in arts and crafts, I thoroughly enjoy working and helping him to do his activities. Today's recipe is inspired by one of his assignment and that's "GO GREEN". 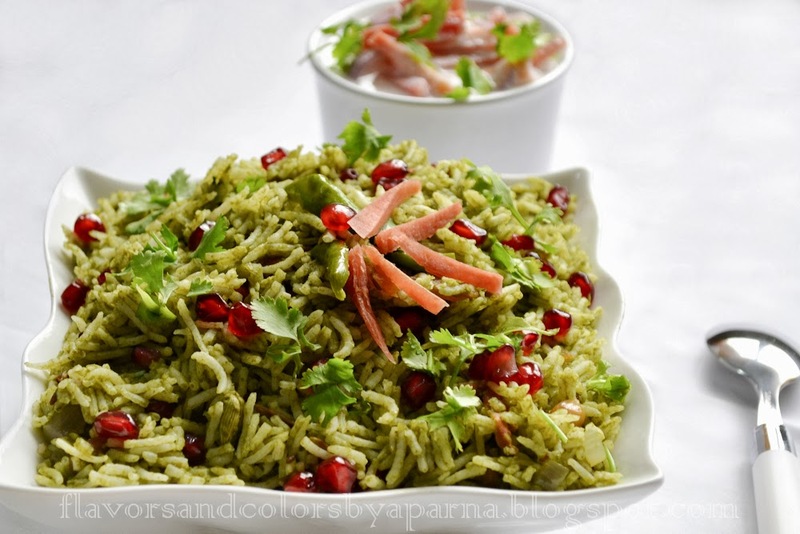 Yes, we are going green with PALAK RICE. I have tweaked the original recipe [from my cookbook] by adding peanuts as well as pomegranate seeds. Sugar to be added while blanching the palak. Cook the basmati rice as per packet instructions. Drain and keep it aside. Allow it to cool. Chop cleaned palak/ spinach. Add little sugar [this step is to retain the color of the leafy vegetable] and blanch the chopped palak. Allow it to cool. Once cooled, blend the blanched palak in a mixer with one chopped onion, tomato and one green chilly to a smooth puree. Keep it aside. In a pan, heat the oil. Add the cumin seeds, as they splutter, add bay leaf, cloves, cardamom and cinnamon. Stir it. Add chopped onion, ginger garlic paste and sauté' it till the onions become soft. After this add chopped tomato, finely chopped green chilli [optional], turmeric powder and palak puree. [You can also add garam masala powder, I have omitted this ingredient here]. Fry it until the raw smell disappears and the paste becomes little thick. 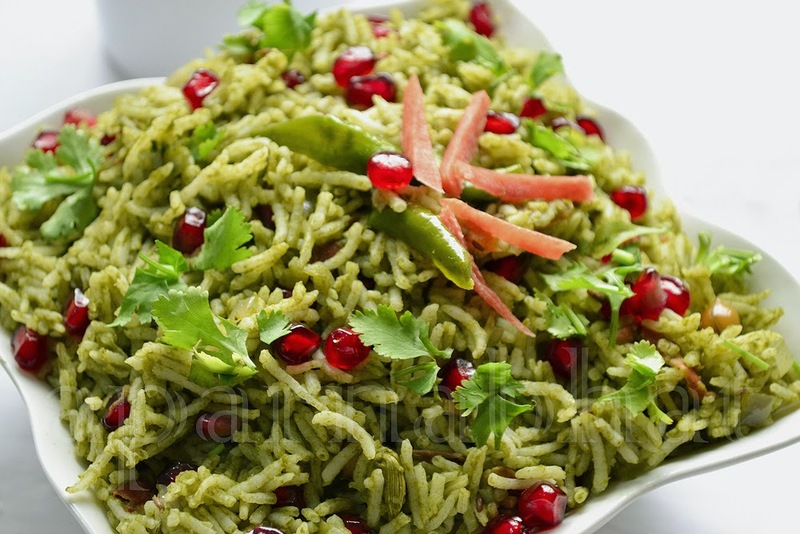 Add half the quantity of chopped coriander leaves, roasted peanuts, half the quantity of pomegranate seeds. Add salt, give a nice stir and switch off the flame. Add cooked rice and mix well till each grain gets coated with the paste. Garnish with finely chopped coriander leaves, rest of the pomegranate seeds and serve it with plain curd or raita.